On RTE 138 South just south off the corner of Randolph St.
Take Rte. 93 South. At Braintree/Dedham fork, stay in right lane towards Rte. 95. Continue straight approx. 4 miles staying in right hand lanes. Get off Exit 2A (Rte. 138 South Stoughton/Canton). Take Rte. 3 North. At Braintree/Boston fork, stay in left lane towards Rte. 95 Dedham. Take Rte. 90 East on Mass. Turnpike to 128 South. In Dedham at Rte. 128/Rte. 95 fork stay in left hand lanes towards Rte. 93 North. Continue approximately 2 miles and get off Exit 2A (Rte. 138 South Stoughton/Canton). Take Rte. 95 North towards Boston. At Rte. 128/Rte./95 fork stay in right hand lanes to Rte 93 North towards Braintree and Boston. Get on Rte 128 and get off first exit, Exit 2A (Rte. 138 South Stoughton/Canton). At Rte. 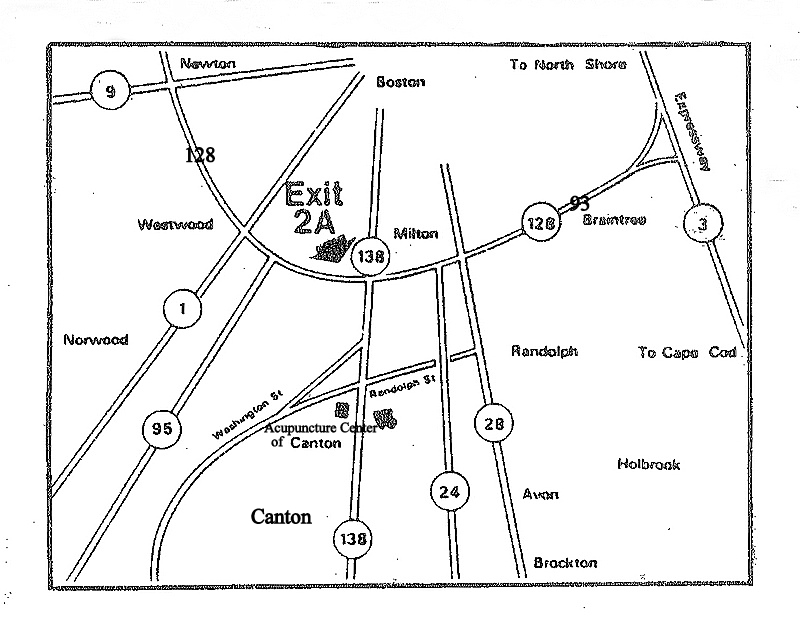 128/Rte.24 fork stay in left hand lanes to Rte 93 South (towards Norwood and Newton). Get on Rte 128 and get off Exit 2A (Rte. 138 South Stoughton/Canton). You will be in Canton and going south on Rte 138. Stay straight on Rte 138 South for two traffic lights. 2nd light (Randolph St.) on the right. Pull into the small parking lot.